Assigned to the 5th Air Force, 3rd Bombardment Group, 90th Bombardment Squadron. No known nose art or nickname. When lost, engines R-2600-13 serial numbers 42-76989 and 42-76979. 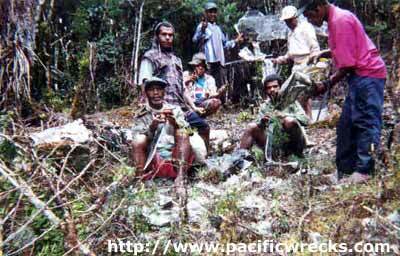 Weapon serial numbers not noted in Missing Air Crew Report 2565 (MACR 2565). On February 1, 1944 took off from Horanda Airfield near Dobodura at 7:10am piloted by 1st Lt. Walter R. Gerry on a flight bound for 7-Mile Drome near Port Moresby. Aboard were several passengers from the 27th Air Depot. Pilot Gerry last radioed Port Moresby at 8:00am, advising he was returning due to bad weather, but was never heard from or seen again. When this aircraft failed to return this bomber was officially declared Missing In Action (MIA). 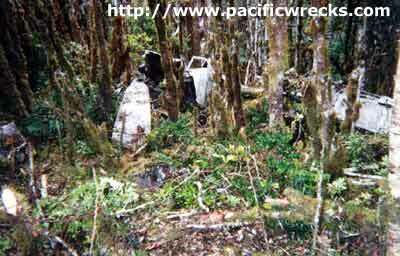 In fact, this B-25 crashed near the peak of Mount Kenevi at an elevation of 10,500'. On April 29, 1961 the crash site was located at roughly Lat 9.06 Long 147.44 by accident during a joint Australian Administration patrol between a RAAF Searcher Team led by S/L Keith Rundel with an American recovery team. At the time, the team was searching for Anson LT294 which they later located elsewhere in the area. At the crash site, the remains of the crew, plus an unopened parachute were located 200 meters behind the crash site, with attendant human remains, indicated that at least one crew member might have bailed out before the aircraft impacted. 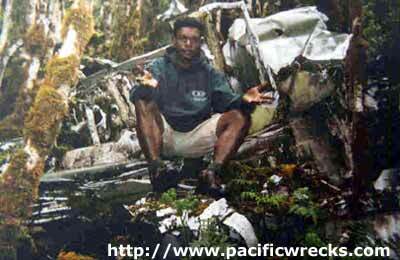 In 2001, Wilkinson Egimbari visited the crash site and found personal effects and significant human remains among the wreckage. After the 1961 recovery of remains, the recovered crew members were buried in a group burial at Arlington National Cemetery at section 34 site 4286. "The article on your website, Journey to Mount Kenevi has sparked renewed interest by my family. I am the youngest of Charlie L Fann's nieces and nephews and am very interested in this segment of our family's history." American Battle Monuments Commission (ABMC) - Walter R. Gerry "His remains have been recovered"
American Battle Monuments Commission (ABMC) - Angelo C. Dellisante "His remains were recovered"
American Battle Monuments Commission (ABMC) - Rudolph W. Johnson, Jr. "His remains have been recovered." American Battle Monuments Commission (ABMC) - Lamar S. Russell "His remains have been recovered"
American Battle Monuments Commission (ABMC) - Marvin E. Culbreth "His remains were recovered"
American Battle Monuments Commission (ABMC) - Charlie L. Fann "His remains were recovered"
American Battle Monuments Commission (AMBC) - Jack E. Beals "His remains were recovered." American Battle Monuments Commission (AMBC) - Edward R. Howard "His remains have been recovered"
Thanks to John Douglas, Brian Bennett and Michael Claringbould for additional information.